I’ll preface this post with an apology for the photos… achieving adequate lighting for a picture on the wall is harder than I thought! I was always big on crafts as a kid (family, remember my dolls made of pens? Heck yes!) and it sort of got away from me… my creativity isn’t exactly at its prime and time is always an issue. I gotta work on this! This project can also be a constant changer! 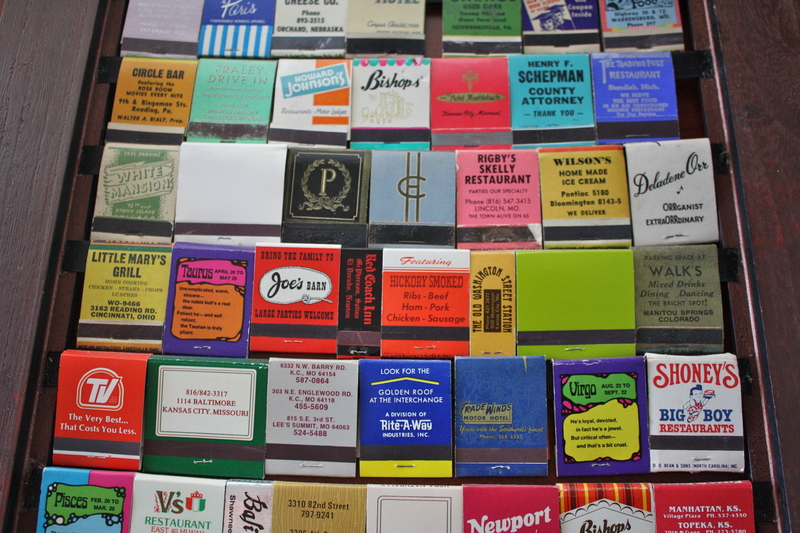 Find a cool new matchbook? Replace one of the old ones! It’s so easy to change! Black ribbon (any neutral color is fine). I used a 1/2″ wide, grosgrain, black ribbon. *Start your collection now! 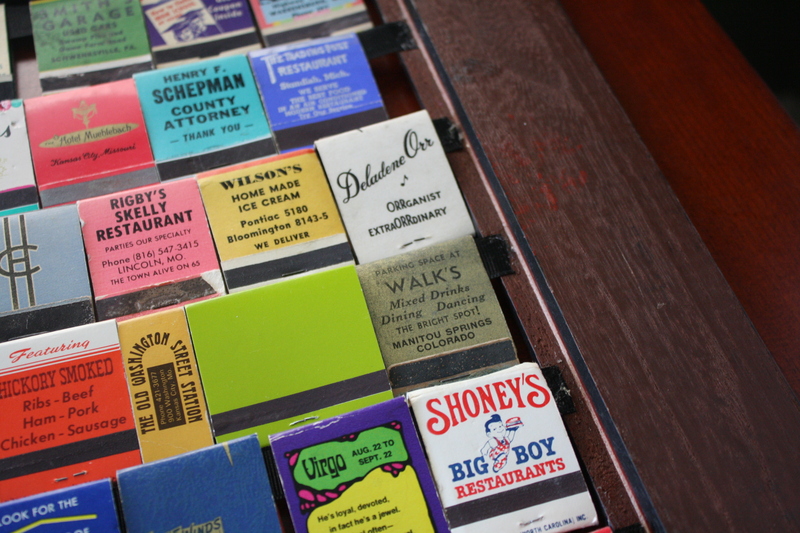 If you search hard enough, almost every antique mall has a booth with hidden jars of vintage matchbooks. Look for colorful ones, fun ones, quirky ones, or ones that spark a memory! I went with the colorful, bold ones and the ones with fun pictures. 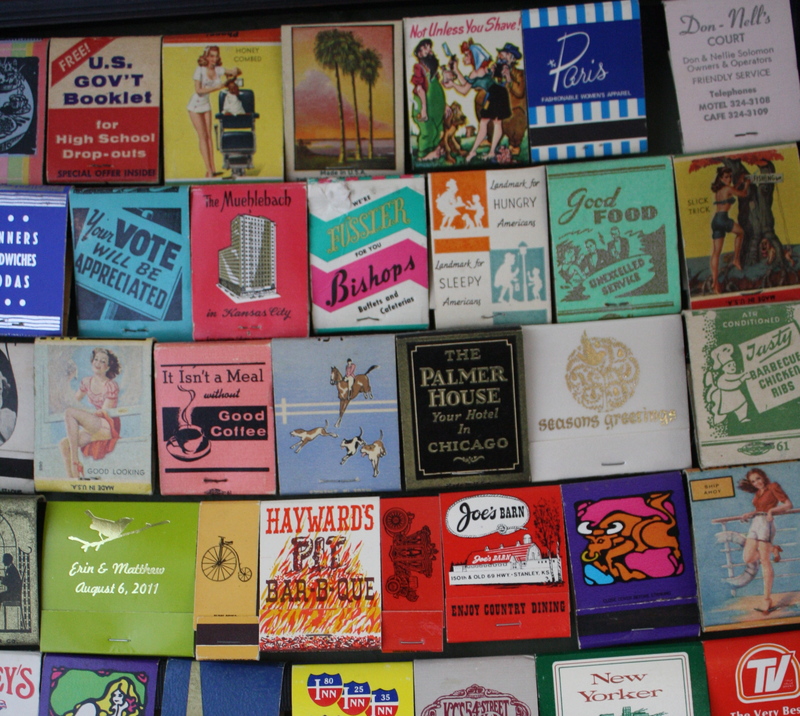 Matchbooks are such a fun item to collect. You can bet there’s a story behind each one. -Cut strips of ribbon the length of the back of the frame. -Glue strips of ribbon on one side of the frame first. Glue them approximately 1″ apart (far enough apart to accommodate the height of the matchbooks). You’re going to want to play around with this a bit and make sure there’s as little space between the rows of matchbooks as possible. Let the glue dry. -Once the first side is dry, glue the other piece of the ribbon to the other side of the frame. Let dry. -You’ll end up with strips of fabric strung across the back of the frame. 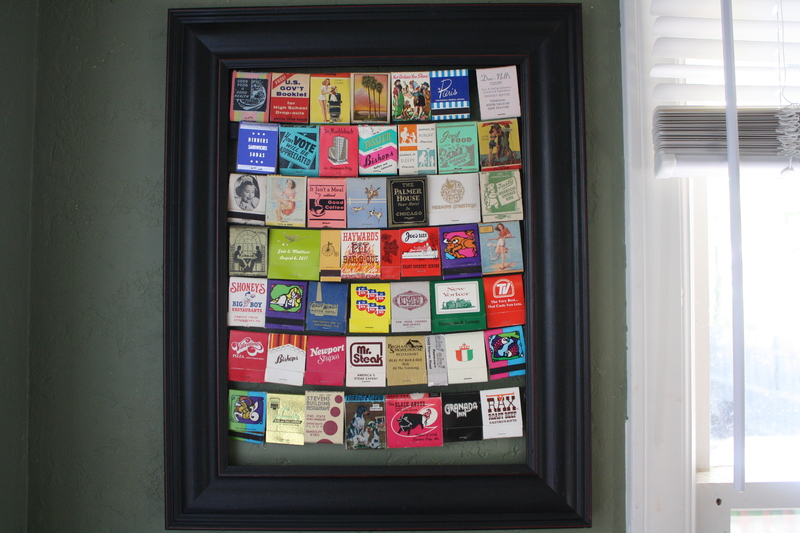 -Now the fun part- hang the matchbooks on the strips of fabric! Super easy and so fun. Overall, it took about an hour to complete (that’s including glue-drying time). Happy Friday, loves. Now get crafting! I absolutely love this! My boyfriend and I are still in the process of decorating our apartment (not that it ever really ends), and I think this would be perfect for our kitchen. 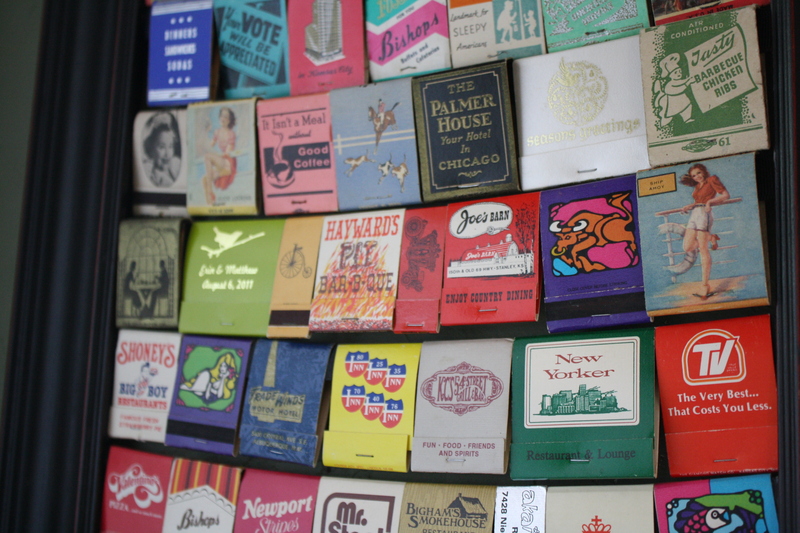 I’m definitely feeling really inspired now and will be on the hunt soon for some vintage matchbooks. Thanks for sharing! I love this!! Looks super cool in your home as well…I like the idea of being able to change it up as you like….and of course, anything that has to do with antique shopping, and I am all over it! !